I have been given this task of writing a profile page, but i’m not sure where I should begin. It is impossible to put in words what Inddiethumpers means to me, but let me start off by saying first that it has been one heck of a ride since more than a decade now. I learnt riding 2 wheelers on my uncle’s old Deluxe Blue bullet in a sleepy Punjab village and have ever since been hooked on to bullets. In the year 2001 I was able to save enough money from my job to take a loan to buy a brand new Black Machismo 350cc. 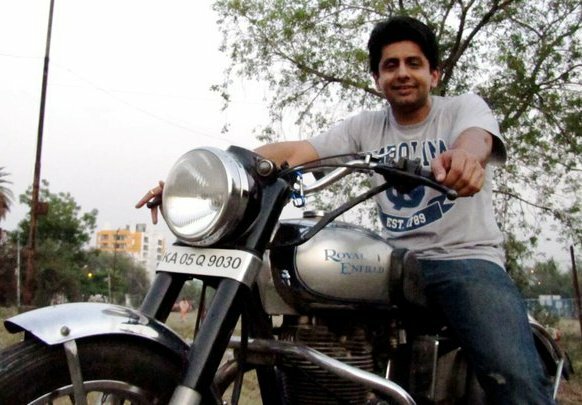 This bike that I christened Juggernaut proved true to its name and was instrumental in meeting up with Rasik to form the club way back in December 2001. My hunger for a faster bike led me to buy a 500cc & later a RD 350. Along the way i met my wife Shweta and we had many a great rides with the club. Apart from the rides, the hangouts at band stand/carter road with fellow thumpers were such a blast and forever etched in my memory. The most exciting times of our lives for sure! I had to come to US on a work assignment in Oct 2003 and we have settled here since. But I yearn for riding with my fellow thumpers every time i hear a ride being planned. I am currently in a phase of life where family takes precedence over riding since we have 2 little kids who seem to be growing really fast. Still, I manage to find some time in between to ride a couple of bikes i have kept here. I have a Triumph Rocket III and a 500cc British Green Royal Enfield. Whenever we go back home I look forward to meeting fellow thumpers and always try to at least get one ride in with them to keep that old spark burning. The best thing about riding with thumpers is the countless friendships I have formed within and outside the club. Just like my old 500 is still being maintained by a dear friend Indar in Nagpur, my old friendships are still maintained and going strong as ever.